Colorado Coalition for the Homeless leads and coordinates the Denver Street Outreach Collaborative (DSOC), which includes the City and County of Denver, St. Francis Center, and Urban Peak. Outreach programs are an essential component within the homeless service continuum of care. They help individuals establish trusting relationships with Coalition staff and with services to move them from long periods of living on the streets or in shelters toward stable housing. 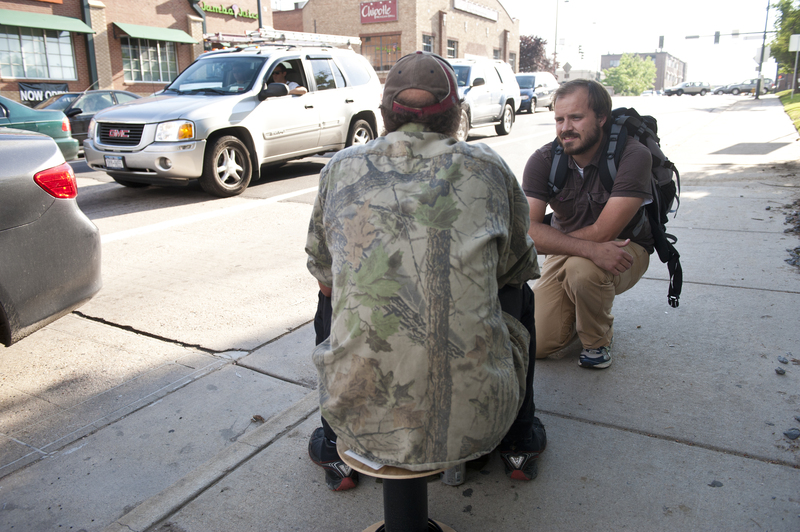 The basic goals of street outreach programs are to address immediate needs of safety, provide crisis intervention, and ultimately to connect people to housing, medical and mental health care, public benefits, clothing, food, and other supports. Outreach programs engage people “where they are” in their own environment such as greenbelts, parks, doorways and alleys, vehicles, tents, temporary shelters or under bridges. People living in these settings are often isolated and highly vulnerable due to physical and mental illness—issues that make it difficult for them to seek out services on their own. The DSOC provided services to homeless individuals through over 30,000 contacts and assisted 274 people in obtaining permanent housing in 2015. The Outreach Behavioral Health Navigator Program is designed to support people living on the street who suffer from significant and debilitating mental illness by clinically engaging individuals in their environment. Through collaborative efforts with the DSOC, two Behavioral Health Navigators (BHN) identify and engage individuals living on the streets and other places not meant for human habitation who are not accessing needed behavioral health care on their own. The navigators work directly with both homeless and mainstream community providers to identify, assess, diagnose, consult, educate, treat and/or coordinate more appropriate care on behalf of the clients of the DSOC. The BHN meet regularly and consult with care providers in the community and within the agencies represented by the DSOC to formulate treatment plans, monitor progress, and provide ongoing services for those needing and wanting such care. The BHN will assist patients in navigating health care systems for optimal care. Access to services within Stout Street Health Center [LINK], including medical, dental, pharmacy, benefits acquisition, etc. Outreach programs engage people “where they are” in their own environment such as greenbelts, parks, doorways and alleys, vehicles, tents, temporary shelters, or under bridges. A homeless individual’s transition to mainstream services and permanent housing may take months or years to achieve. The duration of each outreach relationship is based on each unique individual and there is no uniform timeline or formula for engagement of clients.